The fact is, an alarmingly high bounce rate (we’ll talk about what a healthy vs. scary range looks like a little later) can be a wake-up call that people aren’t finding what they’re looking for on your site. A healthy approach is to view this as an opportunity for improvement. For bounce rates that are a little higher than you’d like them to be, here are some points to remember and steps to follow to get your bounce rates back to manageable levels. When analyzing your website data, you may come across a high bounce rate. This is the number of people who are landing on your website and then immediately leaving. It is important to realize that a high bounce rate doesn’t automatically indicate a problem. If someone lands on your site and is looking for an address or business hours, it wouldn’t be unusual for someone to land and bounce. A visit to your business would still be considered to be a conversion. The problem is when people land, bounce, and don’t convert. Those are the prospects we want to focus on. Your job is to find out why people are bouncing in such high numbers. A website’s bounce rate is the percentage of people who have landed on your website and don’t browse any further. In other words, bounce rate represents single page views only. To find this number, most people turn to Google Analytics. Google Analytics will give you each page’s bounce rate, which represents all single page views. GA will also give you the average bounce rate of your entire site. This is calculated by taking the total number of bounces across all of the pages of your site (within the time period you’ve specified) divided by the number of entrances across all pages during that same period. It is important to look at these metrics in conjunction with one another. For instance, if you notice that the average time on site is high and your bounce rate is high, that means that people have probably succeeded in achieving their goals with your site without the need to navigate further. An example would be an informative page that also contains a phone number. Your prospects landed, became informed, and possibly called your number. Though the bounce rate is high, the page is successful. Again, the problem is when there is little engagement on behalf of your visitors and you are experiencing a high bounce rate. That’s when steps should be taken to lower your bounce rate. What is a Good Bounce Rate? Average Bounce Rate? The majority of website bounce rates fall between 26% and 70%. 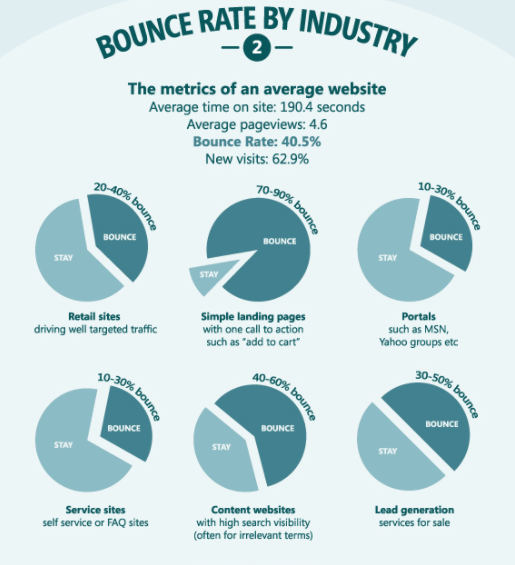 Neil Patel also put together an infographic that shows the average bounce rate according to industry. Where does yours fall? As far as analytics are concerned, bounce rates are highly subjective. Your goal is to keep your bounce rate as low as possible while simultaneously boosting your site’s conversion rates. A high bounce rate is anywhere in the 70s or higher in conjunction with low conversion rates. Higher bounce rates and low conversions are always bad — and that’s what you should focus on. The confusion comes in when you have high bounce rates that are perfectly normal, like those of blog pages. Even Google admits that blog posts commonly share higher bounces. So, where does your bounce rate have to be before alarm bells start going off? Don’t automatically become frustrated if your site-wide bounce rate is high in Google Analytics. Instead, look at each page individually and assess the bounce rates of those pages. Are there any that can be improved upon? Are people spending a long time on the page? Are they converting on a goal? Are they returning to the site after their initial visit? If you come across a page that has low time on site, a high bounce rate and that isn’t converting, that’s a red flag and should be addressed immediately. By working on those pages with high bounce rates and otherwise low engagement, you can effectively lower your site-wide bounce rate. And, you may manage to boost your conversions at the same time. Only time and proper site testing will tell. More on that in a bit. People generally land on websites to learn more about a particular subject. If your content doesn’t speak to your prospects’ needs, those individuals will quickly find a competing site to occupy their time. Instead, ensure that you understand your audience fully. Most importantly, do your best to discover why people choose your site over another competing website. Once you have the “why” in mind, develop engaging content that speaks to your visitors and their unique objectives. Your content should effectively answer your visitors’ questions and alleviate their concerns, helping to pave the way toward the conversion. If your site is populated with boring, incorrect, messy, or irrelevant content, your visitors will bounce and your conversions will suffer. Instead, be empathetic with your content and speak to your audience while providing them with the information they need to become happy and loyal customers. Visitors to your site will decide whether they want to stay or leave within a few seconds. If the colors aren’t pleasing, the layout isn’t organized, and your navigation isn’t easy and intuitive, your visitors will be more apt to click the back button than navigate further. 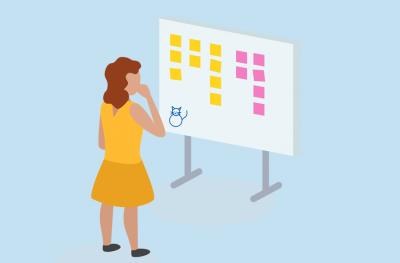 When it comes to user experience or UX, it’s important to remain lean. That means having a simple but eye-pleasing layout and design, a navigation menu that is quick and easy, and content that is just adequate enough to entice visitors to convert. If your site rambles, contains too many irrelevant images or contains other content elements that add more clutter than value, your bounce rate will likely rise because people aren’t sure what you want them to do next. 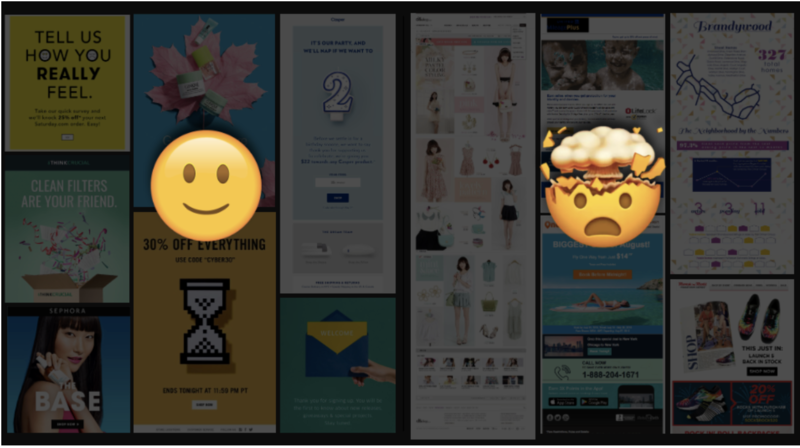 Instead, go for a lean UX that keeps your visitors happy, educated, and constantly converting. These errors might remain on your site without you knowing about them. Is the design easy on the eyes? Is the content lean enough to entice the conversion? Are there any errors that make you want to leave immediately? If there are errors of any kind, those will need to be taken care of immediately. Only then can you hope for the page’s bounce rate to fall. Your website should load nearly instantly. Anything longer than a few seconds is far too long as far as the Internet is concerned. Use a platform like GTMetrics, which will give you a report on your website’s speed. If your site is loading too slowly, the platform will give you tips on how to fix it. Google’s Search Console can also give you speed insights and advice on making your site blazingly fast. Even a single second improvement to your site can deliver more traffic and conversions. And the fact is, a faster loading site may be just the thing you need for a lower site-wide bounce rate. When assessing your site’s bounce rate, it helps to be systematic with your processes so that you leave no stone unturned. Here are seven steps to take if your bounce rates are suffering and you want to see them as low as possible. If your site’s overall bounce rate is high, it’s likely that there’s at least one page that is suffering the most. Find that page and isolate it. Then, navigate that page like a normal visitor while taking plenty of notes. Look at the other metrics of the page. How long are people spending on it? Are they achieving their goals despite a high bounce rate? Next, look at the page’s design, navigation, and content. Determine if the page is the best it could be and if your goals as a visitor have been met. Website recording is a helpful technique that lets you see just how visitors are navigating through your website. You can see where they’re hovering their cursors, clicking, and which avenues they’re taking as they move toward the conversion or bounce. Website recordings can help you see where improvements can be made. This is ideal for any pages that experiencing excessively high bounce rates. Once you have a recording tool installed on your site, return to the page with the highest bounce rate and see how visitors are acting right before they exit. 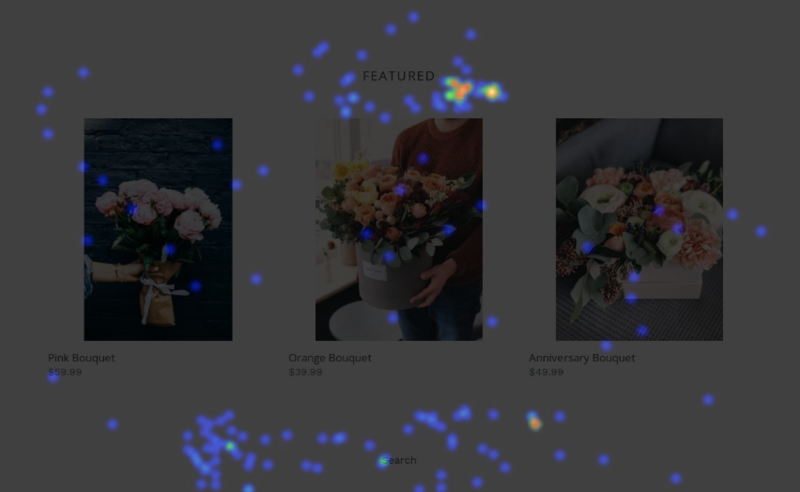 Heatmaps are another visualization tool that can help you determine what visitors are doing when they land on your website. Using heat indicators, you can see where the most engagement is occurring. If you notice that the majority of visitors are clicking their cursors in the top right corner, for example, that might be a prime spot for a call-to-action button. When used on the page with the highest bounce rate, you can see where visitors are engaging and where they’re not. That can give you important data you can use to make improvements to the offending pages to potentially lower the bounce rates over time. Once you’ve identified places where people seem confused or elements that people seem drawn to, you’ll want to make a few adjustments on the pages with the highest bounce rates to see whether rearranging, adding or eliminating content can help. With recordings and heatmaps guiding you in your quest to improve your highest bounce rate page, you can potentially experiment with headlines, images, content, CTAs, and other conversion elements. 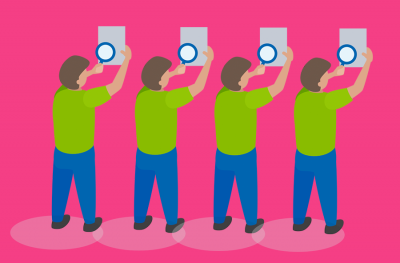 Known as an A/B test, you will clone an existing page and make a change to one element, such as the headline. By showing the same page with two alternating headlines to the same audience, you can determine which one is more crowd-pleasing. A/B testing holds immense value for helping you lower your bounce rate across your entire site. Many tools that provide website recording and heatmaps also allow for A/B testing. You can use these tools to test elements on your website in real time. You can even engage in multivariate testing, which is where you simultaneously test multiple elements to see which ones perform better. This type of testing can help you find the right combination of elements that lower the bounce rate and improve conversions. If your bounce rates are high, A/B testing can help you lower them. After each A/B testing experiment, you will want to implement the optimization winner of each test and then assess visitor engagement. Comparing before and after snapshots of how visitor behavior has changed is a great way to do this. Give each test and assessment time to yield the proper data. Otherwise, you’ll find yourself making too rash and quick decisions that can actually serve to increase your bounce rates if you’re not careful. The key is to go with slow and gradual optimization. This isn’t jarring for visitors and allows for proper bounce rate optimization that can improve the value of your site in the long run. Even if your bounce rates begin to fall, your job is not through. It’s likely that there are always improvements to be made. Not only that, but your site may need to be altered over time to keep up with the ever-changing needs of your audience. The lesson is to always leave time for bounce rate assessment, website recording, heatmaps, A/B testing, and bounce rate optimization. With enough steady attention, you can keep your bounce rates low, conversions high, and your audience as happy as can be. Crazy Egg was an early innovator of heatmaps technology. The platform also allows for website recording and A/B testing, among other important capabilities. This makes Crazy Egg one of the best solutions for web marketers looking to lower their site’s bounce rates page-by-page and site-wide. The technology can also be used to enhance conversion rates. Once your bounce rates have fallen, the next step is to sell to those who have managed to stick around and browse. With a low bounce and high conversion rate, you’ll have on your hands one successful website. The great news is that Crazy Egg offers a 30-day free trial. This lets you try the platform risk-free, allowing you to test and ultimately improve your website’s performance in rapid fashion. By now you likely know your site’s overall bounce rate. Does it seem high to you? If so, does it still seem that way when assessed with all the other metrics? If you’ve assessed your side and your bounce rate is still high, you now have a playbook to follow. By assessing your site’s content, checking for technical issues, and by using technology like website recordings, heatmaps and A/B testing from platforms like Crazy Egg, you can maintain lower bounce rates for greater digital marketing success. It all comes down to providing the best user experience possible. If you give your audience exactly what they want, they’ll be more likely to land, browse, and convert.